The leaves are changing colour, there’s a chill in the air and you have probably scraped frost from your windshield. With the winter season fast approaching, we are reminded that life itself comes with its own seasons, and that our senior years can be life’s winter. At this time of year, caregivers helping seniors will need to become more aware and take more precautions. Rick Lauber, author of Caregivers' Guide for Canadians, has provided us with a list of five essential things the elder caregiver needs to know, based on his own experiences as a co-caregiver. Take care of yourself: Granted, this advice pertains to caregivers year-round; however, caregivers need to more health-conscious during the winter. With all the running around caregivers can do, it’s easy to get run-down. When the body is tired and weak, a person is more apt to become sick. The standard advice of eat well, exercise regularly and get plenty of sleep all applies here. If you do get sick, stay away from your loved one to avoid spreading an infection. Dress your loved one for the winter: When taking Mom or Dad outside, remember to clothe them appropriately for the cold. Layers, along with a longer parka (extending past the waist), work well to keep one warm. Button/zip-up sweaters will be more convenient than a pullover style. Slip-on boots for Mom or Dad (laces can be time-consuming to tie up …) with sturdy and non-slip soles are a must. Consider boots with removable liners (which makes for easier drying). While gloves can provide more control when driving, senior will find mittens warmer and easier to wear. Keep a senior's home well-lit: Winter’s darker days decrease natural light within a home and can hide potential risks from aging eyes. Replace all burnt-out light bulbs and consider brighter lamps or light fixtures for the hallways and stairways within a senior’s home. Move more slowly: While it may be tempting to rush from one warm destination to another, remember that winter roads (and sidewalks) can become treacherous and accidents often occur. When taking Mom or Dad out for an appointment or running an errand yourself, leave early and drive for the weather conditions. When walking, firmly support Mom or Dad, avoid icy patches and take smaller steps. When driving or walking, pack along your (fully-charged) cell phone just in case – even on short trips. Consider Christmas: Winter comes with the festive season; however, celebrating can take on a much different look and feel for caregivers. Mom or Dad may not be able to join the family to open presents or dine on turkey. If so, bring Christmas to them by decorating their long-term care room, visiting and singing carols or taking over a plate of Christmas dinner. Family traditions may also have to be changed, but keep what you can. Someone else may carve the bird, but you could still use Mom’s dressing recipe. 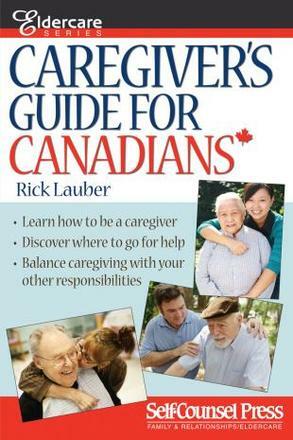 Rick Lauber is a former co-caregiver, established freelance writer and author of Caregivers' Guide for Canadians (Self-Counsel Press). For more info, please visit caregiversguideforcanadians.com.